The following rates are quoted per room per night and are inclusive of a choice of breakfast and VAT. Please note that these rates may vary, so it is always a good idea to confirm the rates when making reservations. Weekly rates may be negotiated by prior arrangement. Free off-street parking for up to 3 vehicles. 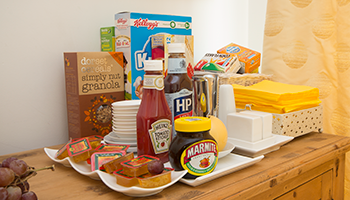 Free breakfast, with choices including full English breakfast, continental breakfast and a range of cereals. Free Internet Access via WiFi throughout the house. Access to a large luxury bathroom with toilet, power shower and bath and a ground floor toilet with power shower. We offer a Full English breakfast as well as many other options such as scrambled eggs, poached eggs, boiled eggs and a selection of cereals such as Weetabix, Shredded Wheat, Cornflakes and Dorset Cereals Granola. The Full English breakfast is an additional £7.00 per person. Toast, either white, brown or multitude and a variety of preserves, marmite and honey, tea and fresh coffee. We are situated in the south of the city, near Marshalls Airport, we have easy access to all of the vital network points such as the A14, M11, Cambridge Railway Station and Bus Station and Stansted Airport. Appletree House is located a short 2 minute walk to a Citi1 bus stop that has a regular direct bus to the City Centre. We are also only five minutes walk from one of Cambridge's latest additions, the well equipped Next Generation gym, and approximately a 10 minute drive from the city centre itself. We have three rooms to choose from, a single room, a double room and the larger family room. Each room has access to one of two bathrooms. Towels are provided for all our guests. Parking in Cambridge can be very difficult and expensive, Appletree House is located very close to one of the bus routes into the city with regular buses direct to the city centre and railway station. Appletree House Bed and Breakfast has a wide selection of Breakfast Options to suite all tastes and appetites, offering quality locally sources sausages from the Gog Magog Butcher and a large selection of cereals too. Appletree House is located a short journey by either car or local bus from Addenbrooke's Hospital, ideal if you need to make an extended visit. 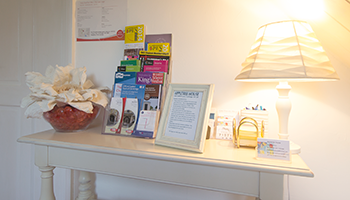 Appletree House is located a short journey from the Cambridge Science Park, ideal if you need to attend a meeting, we have free parking for up to three cars and the journey to the science park is easy any time of day.